If you want to stay cool in the summer without the expensive operating costs of a central air conditioning system, consider powerful, high-efficiency fans instead. They will reduce your energy usage while keeping your living space comfortable. You'll be getting the cooling benefits when and where you need it, and not in unused rooms. Fans are also effective for clearing unpleasant odors that might also be unhealthy, such as cleaning solutions and paints. For people who perform work on their vehicles, fans are also effective for removing automobile or motorcycle fumes from garages. Fans make economic sense in any drafty location where running a high energy consuming air conditioner would be expensive and wasteful. This is especially true in older houses that aren't well-insulated, and in apartments where alterations are not possible. Fans will go a long way in reducing high energy bills in the summer months. 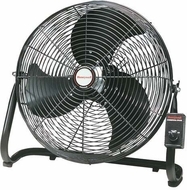 Of the several different styles of electric fans that we carry, floor fans are most appropriate for larger rooms. Some models have oscillating heads, which more efficiently cools the entire space. They also include variable speeds and adjustable height stands. Tower fans also offer wide coverage for a large area and offer advanced features like remote control and timer. They also take up less space with their slender design, which makes them ideal in dorm rooms or small apartments. We also have table fans and the more standard box and window fans. Our fans are from well-known and well-respected manufacturers such as Patton and Holmes.